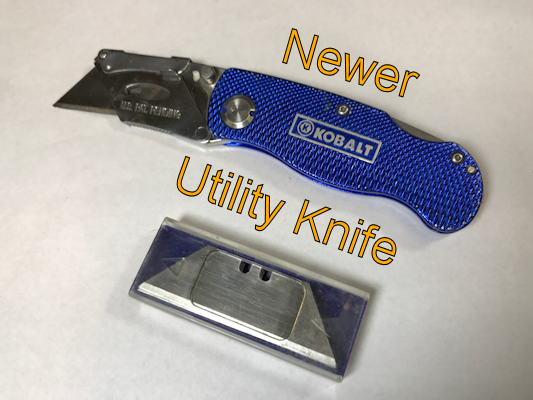 Why Use a Utility Knife? Part of being prepared is having a knife that will be ready and functional every time you need it. The obvious choice for that is a folding pocket knife. But what if you need to cut something you know will dull the blade? 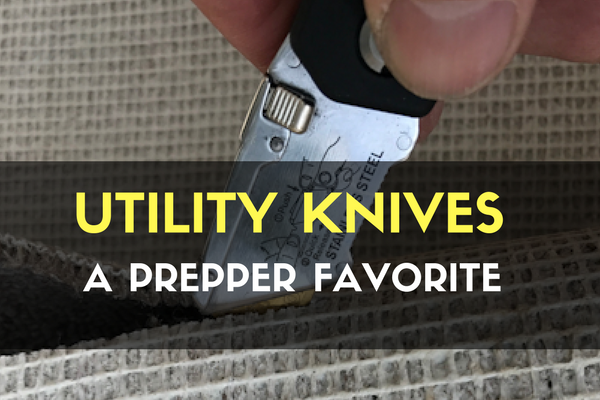 You need a replaceable blade which means a utility knife. Sometimes called a razor knife or box cutter, a utility knife employs common replaceable razor blades to cut pretty much everything. They uses a razor blade that has two ends to it and they all allow you to switch ends of the blade when one gets dull. 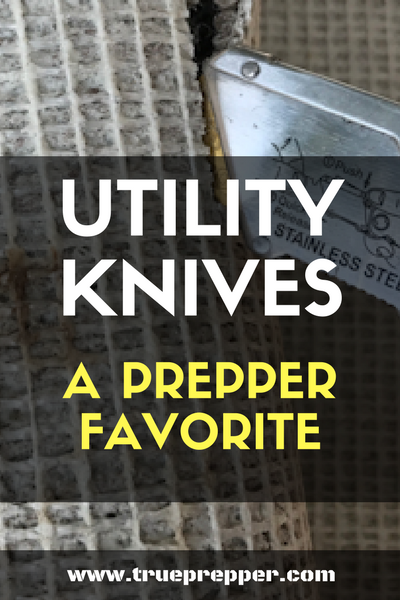 Finding the best prepper utility knife has been an experience in engineering progress. This evolution shows how ingenuity really can make things better. Fair warning: These knives are wicked sharp! Why? They use actual utility razors. I recommend wearing gloves when using them (even though I sometimes don’t myself). When I cut something with a utility knife, I often apply more pressure than with a regular pocket knife. By applying pressure, you increase the chance of slipping, so BE CAREFUL! Also, the folding knives I mention here usually come with a thin plastic blade cover. I toss those because it is hazardous even trying to slip them onto the blade. 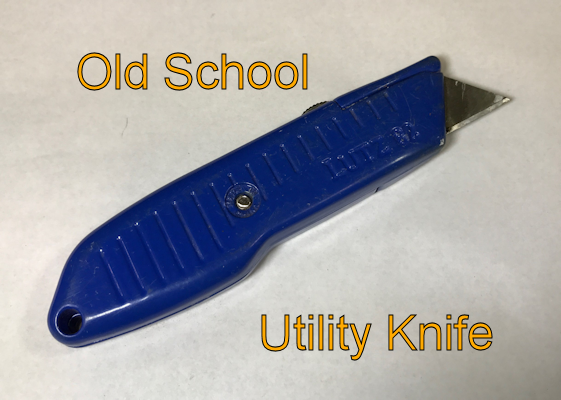 For as long as I’ve been alive, the old school utility knife has been a round-handled shell where the razor blade slides forward when you push on down and forward on a sliding button. Most have several settings where the blade is partially extended or fully extended. There is one huge problem with these. Once they get a little use, any pressure on the blade cause the blade to retract into the shell. That is quite frustrating when you are trying to make a precise cut and the blade disappears. Also, the rounded shape of the old-school utility knife is difficult to grip without it sliding through my big hands. For those reasons, I recommend against that type of knife. On the plus side, it usually had a spare blade in the handle. That was handy, but sometimes hard to get to because you had to extract a screw to open it. Overall on this utility knife, I say “Outta here”, meaning “don’t get one”. Engineers obviously looked at all the issues with the old-school round utility knife and designed an awesome replacement. This is a flat-sided folding lock-knife that even has a pocket clip. It has no internal blade storage, but mine came with a separate stack of extra blades. Now you have two things to keep track of. Not good. But this knife is very functional and has a secure blade. The razor can be changed easily and is rock solid when trying to cut something. To change the blade, just push a button and pull the blade out. How easy is that? The shape of the knife is square, which is not as natural in your hand, but did I mention it has a pocket clip? In my opinion, anything with a pocket clip is better than anything without! I’ve actually carried it in my pocket and it is pretty comfortable. I have used this style of knife many times and it has not let me down. I would buy this model if I wanted to carry it often in my pocket. Here is one on Amazon for $13. It even includes a carrying pouch. 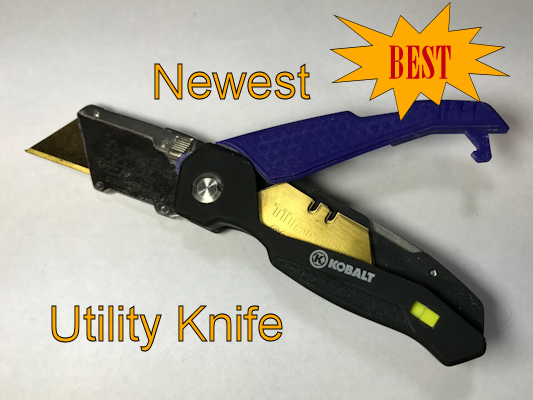 Tool designers decided it is important to have multiple extra blades inside the knife and created the best and newest model. It is generally the same design as the last version, but the added a compartment inside the handle to hold 5 extra blades. Convenient! To do that, they made the handle fatter and now it fits in my big hand better. To change the blade, just left up on a lever, push down on the side and pull the blade out. It holds the blade quite securely. The only down side of this model is that the larger width makes it more bulky if you pocket carry it. I usually clip this model to my belt instead of my pocket. It sits next to my tape measure and is very easy to access. This is the knife I use all the time now and I would recommend this over any other. Here it is for only $13 on Amazon. This highly rated model even has a thumb disc for applying pressure with your thumb. I love my pocket knife and carry with me everywhere. But the real workhorse in my shop is my latest generation utility knife. I abuse it and just swap out the blade and it is just like new again. I recommend one for anyone working on prepper projects, for cutting paracord quickly, and any handyman work around the house. Outside the box thinking. Good. Nothing wrong with having one around, or several, but don’t forsake a good folder or sheath knife for one of these…….I’ve broken more than one blade. Excellent Point! These knives are special-purpose. Also, broken blades can fly at your face. Eye protection is a good idea.